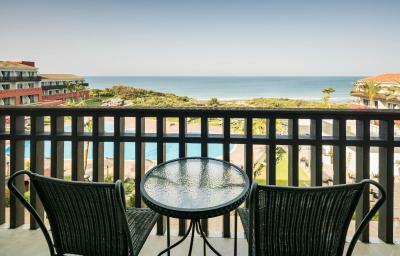 Lock in a great price for Ilunion Calas de Conil - rated 8.5 by recent guests. Everything was great, specially the staff. What fantastic surprise. Breakfast was excellent. Comfortable beds and lovely rooms and general facilities. Gym and pool were very good. Completely accessible hotel with ramps and wide doorways etc etc so no problems getting around. Great location! beautiful beach just outside the hotel. Modern and clean rooms. Delicious breakfast. I will gladly come back! I was here with my boyfriend in the beginning of October, it was perfect! The hotel was modern and clean and next to the beautiful beach. 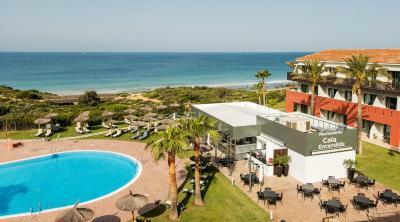 Very nice peaceful hotel, close to the beautiful sandy beach. Delicious breakfast. Free parking available. Specious room with great large bed. Very helpful and kind staff especially Almudena. I arrived at the hotel with crutches because of sprained ankel. She offered me the wheelchair so I could move around the hotel easy and was even able to see the beautiful sunset from the top of the beach. Thank you! Beautiful and empty beaches close to the hotel (in October). Good wellness and gym. Helpful and nice staff. Good variation of breakfast but not so tasty. Clean rooms and facilities were good. Fitness, swimming pool and everything one could wish for was available. It was comfortable, clean and welcoming. Although some Halloween celebrations were in the Hotel the staff was attending and nice. We needed some help and it was dealt with swiftly and smiling. 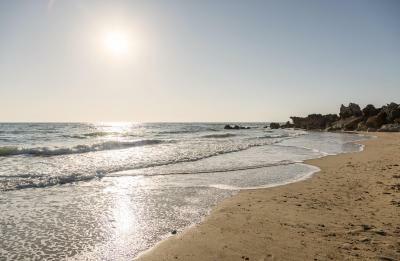 One of our top picks in Conil de la Frontera.Located on the seafront in the Costa de Luz village of Roche, a 15-minute drive from Conil de la Frontera, Ilunion Calas de Conil offers outdoor and indoor swimming pools and a spa. 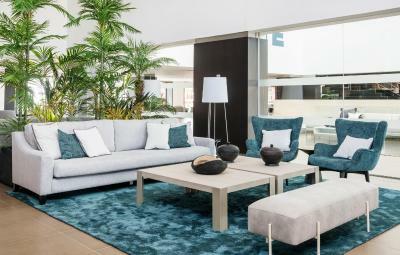 Featuring a private balcony or terrace, each spacious room has modern décor and a seating area. Rooms are equipped with a flat-screen satellite TV. The private bathroom includes a hairdryer and free toiletries. Some rooms offer sea views. 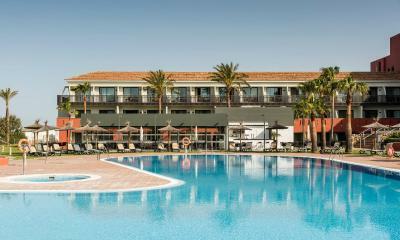 Next to the pool guests can enjoy a snack bar and the à la carte restaurant Cala Encendida, serving Mediterranean cuisine and local fresh fish. 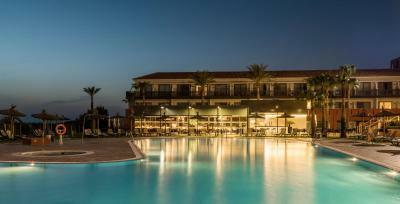 The Ilunion Calas de Conil also has a buffet restaurant that serves traditional local dishes. Free WiFi is available throughout the property. 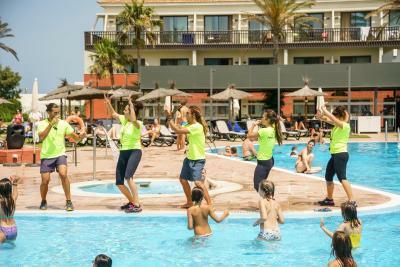 Services for children include a kids’ club and playground, while the varied entertainment programme also offers aqua-fitness sessions in summer and night-time shows for adults. 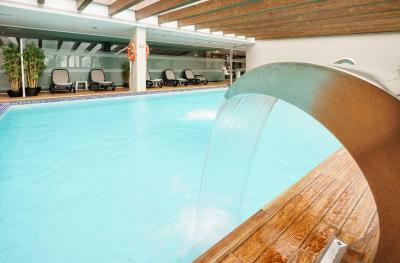 Access to the indoor pool, spa, sauna, Turkish bath and Vichy shower, is offered for a supplement. Massages and beauty treatments are also offered. 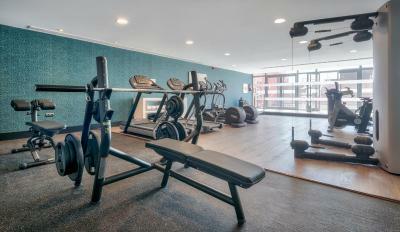 An on-site fitness centre is available for guests for free. Other sports facilities include paddle tennis, water polo and volleyball. Discounts are offered for various golf courses in the area. This hotel is entirely accessible. Rooms adapted for persons with visual or hearing impairment, as well as wheelchair adapted rooms are available on request. 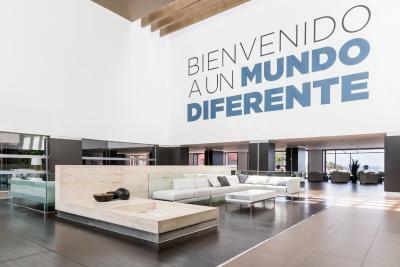 Jerez Airport is a 50-minute drive from the hotel, while Seville is 93.2 miles away. 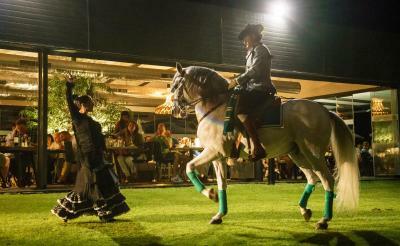 Ilunion Calas de Conil has been welcoming Booking.com guests since 28 Mar 2007. 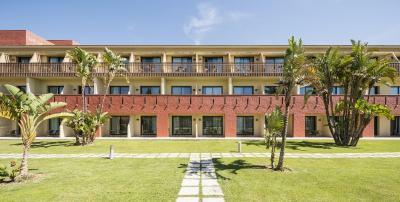 When would you like to stay at Ilunion Calas de Conil? This smart, air-conditioned room features a balcony or terrace, free WIFI, flat screen TV with satellite channels, a desk and an armchair. 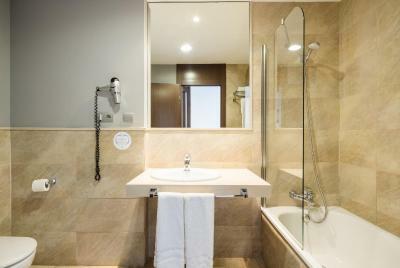 It comes with an en-suite bathroom with bathtub, hair dryer, wardrobe and safe. This smart, air-conditioned room features a balcony with sea views, free WIFI, flat screen TV with satellite channels, a desk and an armchair. It comes with an en-suite bathroom with bathtub, hair dryer, wardrobe and safe. The Family room features 2 interconnecting rooms, one including a large double bed, and the other with 2 single beds. Each air-conditioned room features a balcony or terrace, free WiFi, flat screen TV with satellite channels, a desk and an armchair. It comes with an en-suite bathroom with bathtub, hair dryer, wardrobe and safe. This air-conditioned room has a private balcony, a seating area with satellite flat-screen TV , a desk and an armchair. There is a sofa bed. 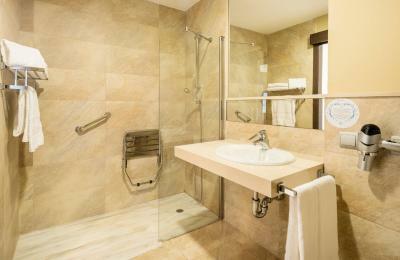 The room comes with an en-suite bathroom with bathtub, hair dryer, wardrobe and safe. 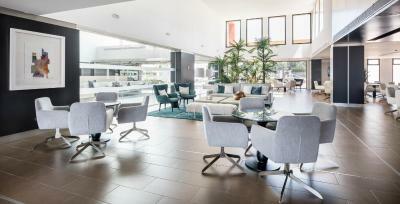 ILUNION is the hotel chain of the ONCE Business Corporation, with more than 25 years in the tourism industry. We focus on the real wellbeing of our customers, but what makes us a unique chain, is our commitment to social wellbeing. House rules Ilunion Calas de Conil takes special requests - add in the next step! Ilunion Calas de Conil accepts these cards and reserves the right to temporarily hold an amount prior to arrival. Please note that the hotel's entertainment program is available during summer, school holidays and weekends. This is subject to the number of children staying in the hotel. Please note that drinks are not included for half board/full board room rates. Please inform Ilunion Calas de Conil in advance of your expected arrival time. You can use the Special Requests box when booking, or contact the property directly with the contact details provided in your confirmation. Location is very secluded, in the middle of a seemingly abandoned community which seemed to be mostly under construction. Perhaps this is because we visited during low season. There are no other restaurants / shops in the area aside from those within the resort. If you want to have more options for eating / shopping you'd have to venture to the nearest town (Conil de La Frontera). The pool costs 6 euros to use per day - quite strange that it was not included in the cost of the room. Property is right by the beach, beautiful scenery. Top notch amenities (pool, gym, etc.). Lots of variety at the breakfast buffet. The rooms were modern and clean. Staff were friendly and accommodating. A bit noisy as we were directly next to the entertainment area. breakfast ok, really busy venue on weekends. I appreciate that my stay was late in the season but it would have been nice to have even a kiosk where one could buy snacks and drinks by the pool, rather than having to go back inside to the bar. Buffet food could have been warmer. 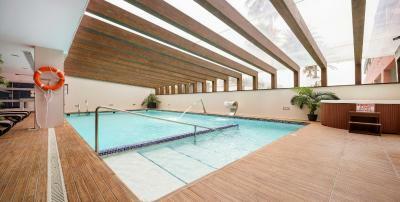 Very close to the beach (including a private and secluded section), fantastic large outdoor pool. If you don't have a car, there's not much else nearby, but that's what we stayed there for. The Spa was only available for 60minutes per booking. The Hotel is quite a big / large facility and that's not my type of accommodation if it comes to breakfast (ques). Besides that i think the sit-in restaurant was overpriced and didn't offer anything special on the menu. Only thing is the location away from any kind of town so you are more or less stuck there. A little more harmony might be between staff as misleading info on breakfast time might have left us happier with the food.